OEF APPLE Awards recognize an "Amazing Performance in Promoting Learning and Excellence." They offer families a way to honor a teacher or staff member at any time of the year, whenever a "thank you" is warranted. For a $20 donation to the OEF, a 5x7 personalized color certificate is sent to the honoree. You can choose exactly what you want the award to say. Whatever reason you choose, you'll be sure to make your APPLE Award recipient feel appreciated for the great job they've done. Send one today! APPLE Awards can be ordered at any time of the year. Orders received during school breaks will be waiting to greet staff when they return to school. Where does the $20 fee go? 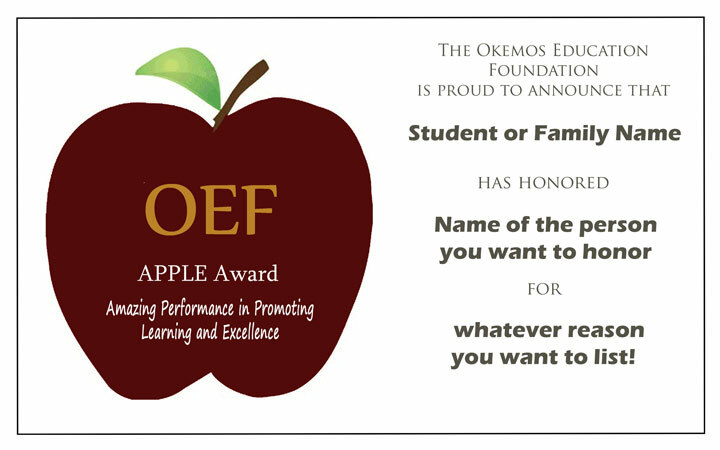 The $20 cost of an OEF APPLE Award is a donation to the Okemos Education Foundation, so it is tax-deductible (as allowed by law) for the sender. The fee is added to the OEF's General Fund for use in support of Okemos students. Will the $20 I paid for my APPLE Award be given to the teacher I honored to be used in his/her classroom? The full amount of the donation is put into the OEF General Fund and is used to pay for grant requests, educational programs, and after-school clubs that the Okemos Education Foundation supports. These programs benefit all Okemos schools (all 7 buildings) and students at every level of the district. How will I know that my APPLE Award order has been received or that my award has been delivered? The OEF will email you a receipt when your award has been printed, so you'll know that we received your order. Once the award has been printed, it is delivered within 1-2 days (perhaps a bit longer if we have to mail the award).